Video Instructions - Able Catch - Ready ... Split. Video Tutorials Make the traps easier. Like anyone I think a picture makes it easier to understand vs written steps. I was able to use my smartphone to scan the code on the trap to watch the video. It actually made my smart phone seem smarter. At the same time, I used the reminder feature to set an appointment for 91 days from now to change the trap. We are receiving reviews and feedback on the Able Catch Pantry Pest Trap (ACPPT). The design improves on the traditional triangle pheromone moth trap, and contains a number of Eco-Friendly features including a Low-Waste, Zero packaging design. 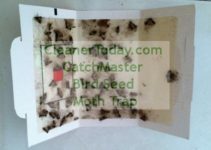 According to “Traps Direct” the Able Catch Moth Trap was created for an e-commerce era, and ships in 2 Moth Trap Sheets with no shelf display packaging because “website images are our digital shelf”, so why waste resources on printing & boxes. Able Catch Traps are also USA made, unlike imported moth traps from China which carry the burden of a Trans-oceanic carbon footprint. We think it Able Catch makes alot of sense.